Welcome to Harmonistan! Berlin-based architect/writer Markus Miessen tackles the pervasive contemporary overuse of the concept of ''participation'' in the final part of his paradigm-changing trilogy. Supported by a nostalgic veneer of worthiness, phony solidarity and political correctness, participation has become the default of politicians withdrawing from responsibility. 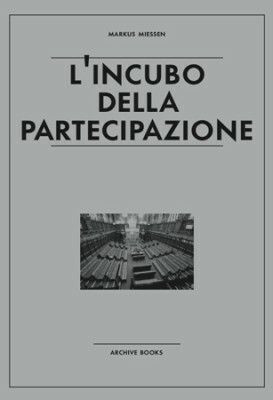 Miessen argues for an urgent inversion of participation, reflecting cogently on the limits and traps of its real motivations. He dreads breeding the next generation of facilitators and mediators, insisting on conflict as an enabling, instead of disabling, force. With refreshing candor, this internationally known architect and professor outlines a format for acting as uninvited irritant, forcing entry into fields of knowledge that arguably benefit from exterior thinking. Sometimes, Miessen writes, democracy has to be avoided at all costs!